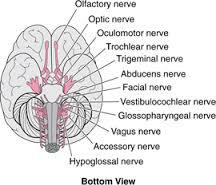 Glossopharyngeal Neuralgia is a painful syndrome caused by irritation of the 9th cranial nerve. The 9th cranial nerve provides sensation in the back of the throat. Irritation of this nerve causes intense pain in the back of the throat, tongue and ear. Although the exact cause is not known, compression or irritation of this nerve is thought to be the problem. It occurs more commonly in patients over 50 years old. It usually occurs on one side of the throat and can be associated with heart rhythm abnormalities. These heart rhythm abnormalities can cause fainting, dizziness or seizure. The pain of glossopharyngeal neuralgia is similar to that of trigeminal neuralgia but glossopharyngeal neuralgia is more rare. The pain can be shooting or stabbing and is severe in intensity. It is triggered by swallowing, chewing or talking. In between attacks, the neurological exam is normal. Any neurological abnormality that is evident in between attacks could be an indication of a serious problem such as a brain tumor and should be investigated. MRI and CT scans are useful to look for intracranial abnormalities that may cause this condition. Treatment begins with medications such as carbamazepine, gabapentin and baclofen. In cases that are resistant to medications, microvascular decompression of the cranial nerve may be necessary. Other modalities of treatment include percutaneous radiofrequency rhizotomy and stereotactic radiosurgery.